Hi there! Happy Sunday Funday! I hope you're in the middle of a happy happy weekend! I'm going to get right to it because this is a heavy pitcher post. Go get your glass and I'll wait a sec. Those of you who have seen my garden art wall know that my son and DIL have passed their love of succulents on to me. It took me a while to understand that (at least in this climate) succulents are not the same as cacti and they do not like full sun for hours every day. Once I cottoned on to the idea, I had very good luck with them. Hence, I bought the Stampin' Up "Oh So Succulent" stamps and dies and DSP when they came out. Of course, then they sat on Mt. NBUS, but no judgment. There are several different patterns in the DSP package so I decided to die cut a few succulents in different colors while I had everything out. These will keep me busy for a bit. There are smaller succulents in the set, too, so I plan to have another card design using those soon. 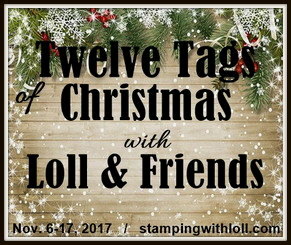 Addicted to Stamps and More: Anything goes. Shopping Our Stash: Tie one on. Simon Says Stamp Wednesday Challenge: Happy Birthday. Watercooler Wednesday: A sketch by Libby. I hope you'll indulge me while I share some photos of springtime among my succulents. Below is another one with three flowers going off in different directions. It used to be full and tight with clusters until a naughty squirrel broke some off checking for his nuts. The nut. We had a wild rainstorm yesterday followed by sunshine, so I quickly got my camera. Enjoy! 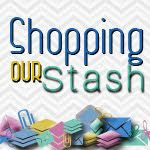 The challenge ends on Tuesday at 11:55 PM PST so dump out that NBUS basket and lemme see what you make with it! Wait. What? No, silly, I don't mean the basket, I mean the NBUS! Thank you, my friends! I'm loving all the entries, both boo-boos or NBUS ~ or both! Click "Jump to Comment Form" and wallah, no more car pool tunnel! Thanks for sharing the beautiful photos of your succulents! I share your love for this amazing plants. LOVE your card! That beauty looks just like one in my garden! The succulent card is gorgeous! 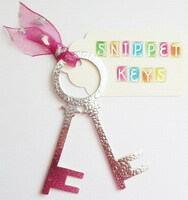 I also have got these dies because my daughter is a SU demonstrator. Her cards and boxes with the succulents have been published in several Dutch craftmagazines. She's very proud about that! Wow! My goodness does that plant look real on your super card. A couple of drops of Glossy Accents and it could have snuck in with your superb drippy succulent snaps. May be taking the plunge and joining in the challenge. Have a great Sunday ........ when you wake up lol! Lovely succulent card Darnell....thank you for sharing your beautiful succulent plants with us..
Oh Darnell - I so needed the smiles your post gave me - you really are hooked on the succulents and yours are beautiful - on and off the card!! Gorgeous card. The cactus looks so real at first I thought it was part of your garden art. I do enjoy seeing photos of your lovely garden. Hi Darnell, Loving the card. My dad had a fair few succulents. Your various plants are lovely. Your card is so beautiful, Darnell! Love all the succulents, I wish I had more! Oh how beautiful is that die cut succulent!! It looks so realistic and your card is gorgeous!! Bootiful succulents . Hugs Mrs .A. Wonderful card, these succulents are fabulous and your real plants too!! Gorgeous card Darnell!! Your succulents are beautiful! My gosh the one on the card looks so real! Loved seeing all the photos! l have acquired many succulents myself and love them all ...they grow so easily. Hope you are enjoying this gorgeous weather and burst of green all around us. Beautiful card, Darnell! Love the colors you've used. Thanks for joining us this week at the Watercooler Wednesday Challenge. Your photos are so beautiful, Darnell! What awesome succulents! I love your pretty card, too! Oh my your card is amazing!! That succulent is so lifelike!! 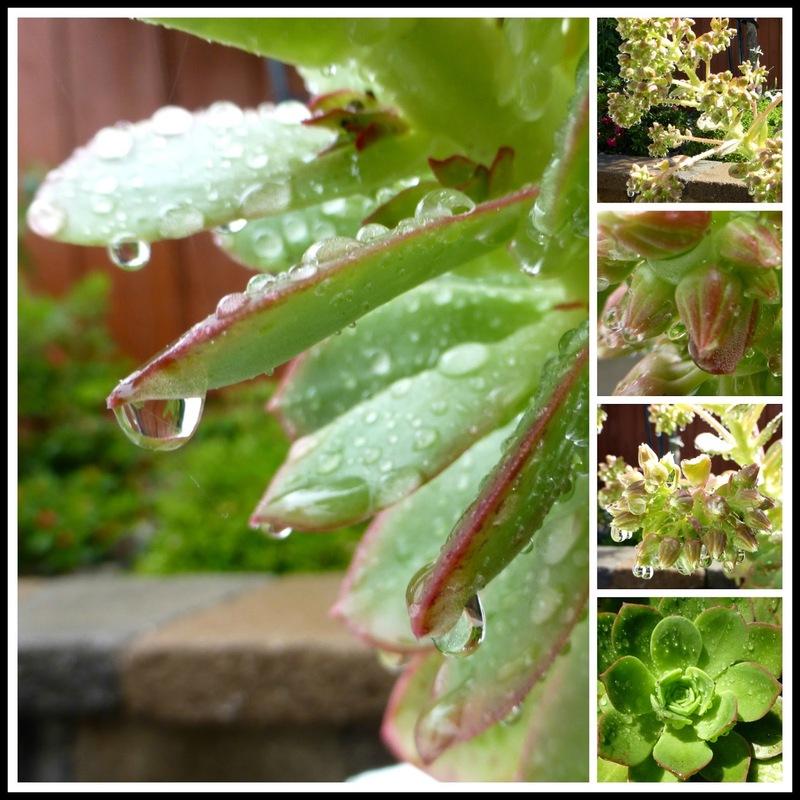 Gorgeous photos Darnell ... Love the raindrops on your pretty plants. Hope you are enjoying your weekend..
Darnell, what a beautiful card for the WWC113 Watercooler Wednesday Sketch challenge. 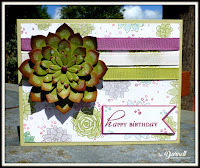 Your succulent card is perfect for this challenge and really showcases the succulents in that stamp set. Love it! Also love your real succulents. You're a talented lady. Awesome, awesome! Your card looks so cool, and more to come it appears. All the succulents you cut are so pretty! AND your garden photos are spectacular! I'm so glad you shared them. I have quite a few succulents, but now I feel like shopping for more! Your card is beautiful using those succulents, but your photography skills are beyond incredible! I love how you captured the droplets of water in those pics!! Awesome job on both! Hope the weather wasn't too hard on those pretty succulents of yours. I'm just beginning to warm up to them, thanks to that wall of yours. I do love looking at all the varieties and, as always, your pics are splendid. Your card is pretty, darn splendid, as well. All those dies your building up will keep you really busy for some time. Gorgeous card. I love that stamp set and dies. Your garden is so pretty. I really like the pictures with the rain drops. 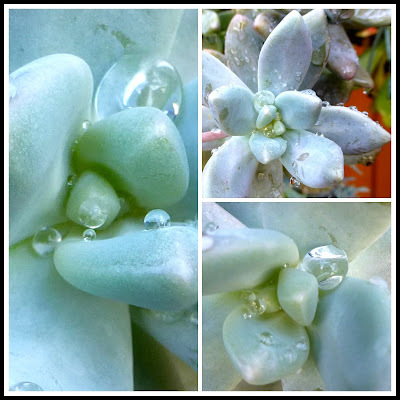 Super card Darnell, and I love seeing all your succulents and the post rain photos. Fantastic. What a totally gorgeous card, a fabulous flower, great papers and super colours, Brilliant. Wow! Beautiful photos...you are rocking the succulents Darnell! Love the amazing pictures and your fabulous card. Seriously, the succulent on your card looks real!!! It's so beautiful! As is your card! Your photos after your rain are so pretty too! Thanks for the LOL you gave me telling us about your Hammy and his backpack with wodka & sunscreen--LOL LOL!! Your succulent card is beautiful, and I really enjoyed the photos of your succulents. I guess my only experience with a succulent is a jade plant (correct me if that's not a succulent.). My mother and I managed to regularly kill jade plants over the years, most likely from overwatering, and I've never really investigated the field further. I wonder if they still make Ripple? Fred Sanford from Sanford and Son was very fond of it. I seem to remember Mad Dog 20/20 and Boones Farm. I'm pretty sure we were splurging when we purchased those..........dare I call them a wine? Yikes! WOWZA Darnell, the succulent on your card looks like the real deal, it's fabulous!! Love the photos of all your plants. I especially like the ones with the water droplets on them. Thanks for sharing them with us!! Wow! That succulent looks so life like, it's amazing! Great card - it must have felt good to use some of the ribbon... Your photos and succulents are beautiful! Have you seen the new international postage stamps (round with a succulent just like that) or maybe they are not out yet??? Your succulents are stunning, Darnell--the real ones & your card! Love your succulents and your awesome card! Thanks for playing along with us at ATSM. Succulents are a big favorite of mine. I bought this set and have yet to try it out. Maybe you have motivated me, my friend. 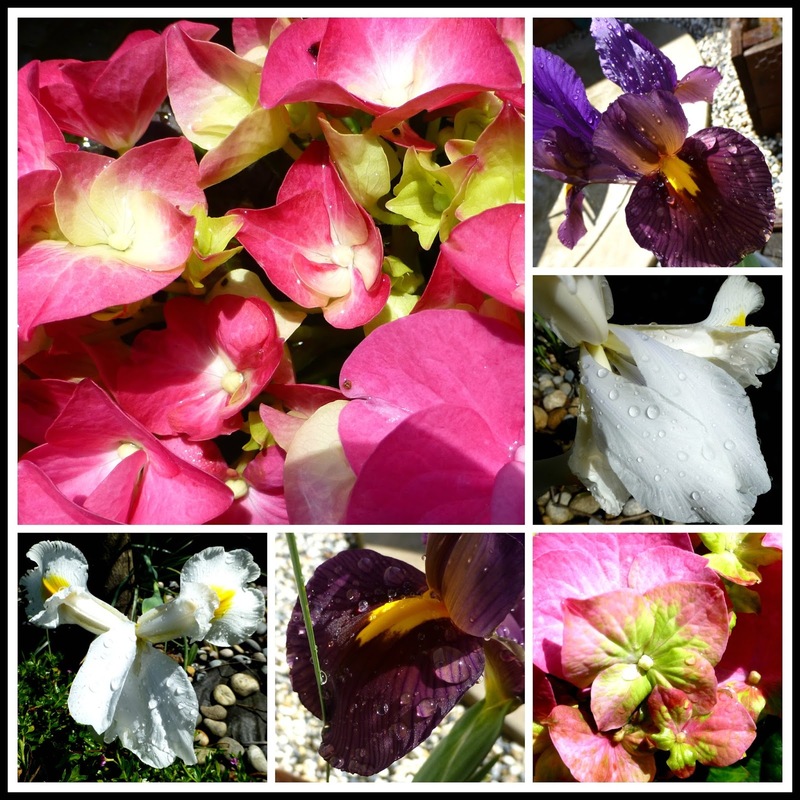 You have a gorgeous assortment in your garden, and far more extensive than ours. As for your card, you really got the colors perfect. Love it. I've told you before, but you won't mind my saying it again: I love your writing style! You always put a smile on my face and something about today's post merited an outright guffaw. Thanks for being you, and sharing your writing gift with us! Darnell, your card is stunning. 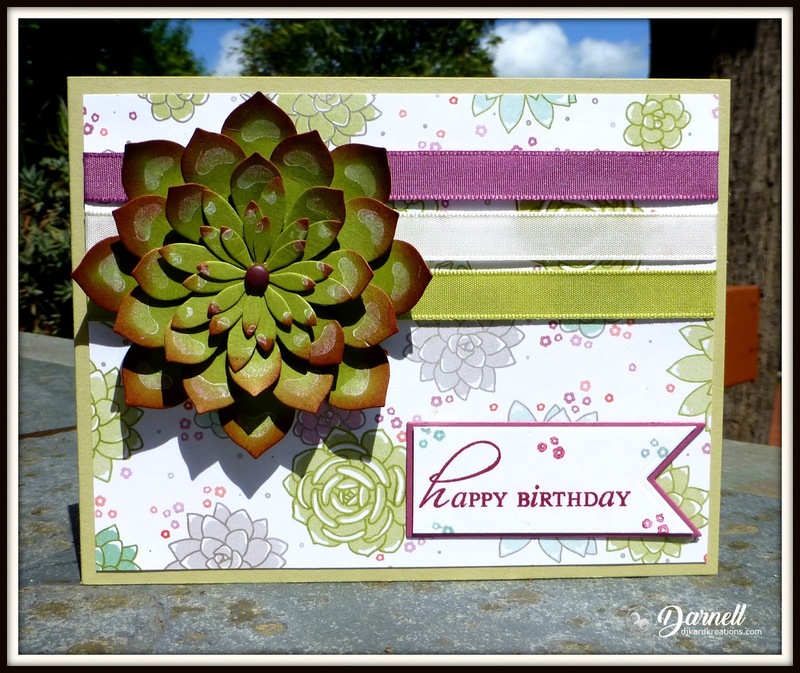 Just love that Succulent stamp set and you have created a beautiful card with the die cut. Thank you for sharing all your pictures. Thanks for joining us on watercooler Wednesday. Darnell the succulent you've created for your lovely card is no less beautiful than the photos of the live succulents which you nurture. Love the colours and sponging! 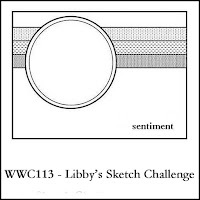 You've used Libby's sketch for our Watercooler Wednesday #113 Challenge perfectly. Thanks so much for joining our challenge this week. Love the card, Darnell, but even more so, love the photos of your succulents. I was just down in Tucson for several days and was amazed by the desert plants - wonderful for me to see as many of them were flowering, and it's a totally different landscape to here at home in the Pacific Northwest! Beautiful card Darnell. Love the colours and the stripes. I have another NBUS entry coming. And what an amazing array of plants/succulents you have. 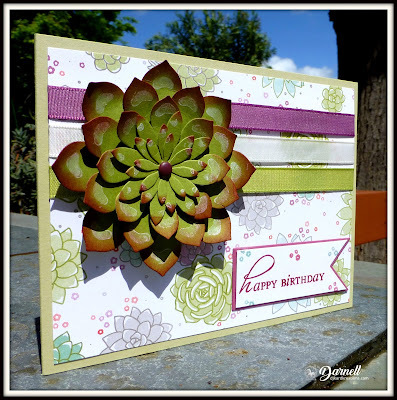 Gorgeous Die cut and sponged Succulent image card design, Darnell. TFS your card and your absolutely Stunning Succulents my friend. Can't wait to see more cards with your succulents and DSP. Hugs.. I have been seeing so many companies coming out with succulent stamp and die sets. I just love the card you made with the SU one. It is gorgeous and I can see you have a lot more ready to put on cards. Darnell, I just had to tell you how much I enjoyed your photos of the succulents! I used to plant and grow lots and lots of them, in containers, in gardens, in rock gardens. I worked as an urban gardening advisor for the Cooperative Extension system and they worked so well in all kinds of soil. They are tricky to get started but then they look so gorgeous! I loved varieties of blue agave, hens and chicks, mixed with portulaca, which makes an excellent groundcover too. I'd love to have that Southern California coastline zone to make a spectacular garden with a "dry riverbed" of river rocks, and loads of succulents and grasses. Love all of your photos! Your succulents are gorgeous, and so is the card! OMG! Those raindrop photos are exquisite, Darnell! You should enter them in a contest or two! And your succulent card is pretty darn nice too! What a great card. I admit, I got sidetracked with your lovely real life succulents though! Thanks for joining my sketch challenge over at Watercooler Wednesday! Please join us again! Wow! Thanks for sharing those gorgeous pics of your succulents. I have a couple of plants that I think are succulents, too, although they could be cacti. They were given to me, so I don't have their proper birth certificates and countries of origin. Your card is gorgeous, too. Your paper succulent looks very nearly like the real thing. Your card is beautiful but the real ones are simply stunning. They are doing so well for you. I'm not good with flowers and our ground is so hard it's impossible to dig up the dirt. I love seeing all the cards in the challenge and happy so many joined in. Beautiful card Darnell. The paper is so pretty. The pics from your garden are lovely. Super succulent card Darnell - I had to look twice because I thought you'd added a real one from your garden. Love the photos too. Such beautiful succulents. And your card is fab. Fabulous card, I almost thought you stuck a real succulent to the front of the card it looks so real. Totally gorgeous card, Darnell! Your succulent is so beautiful, and looks just like the photo of the real thing! 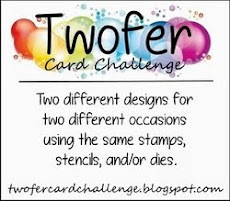 Great idea to place the DSP in the background, too...it highlights the theme for your card perfectly! I adore your Hammy stories...what a helper he is :) Also, I want to thank you for sharing your stunning photos with us! The water droplets look amazing...such a clever time to capture the beauty of this plant! 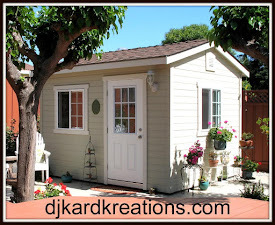 Thanks so much for stopping by my blog to leave some love...I don't know how you get it all done, honestly! Happy Easter to you and your family! I'm late to the succulent party, but I sure am loving them lately. I saw this card in my feed and just loved it. And then to see your real succulent photos...love them!! Beautiful colors on your card. The flower (?) looks so real!